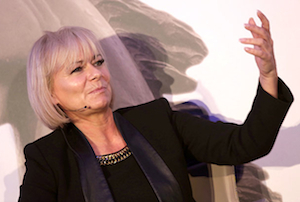 The travel company's chief exec told MT's Inspiring Women conference last week that the company's turnaround would take around six years, not two. Thomas Cook chief executive Harriet Green has stepped down from the controls of the beleaguered travel company after just two-and-half years in charge, as it reported sales and profits had fallen again, despite telling MT’s Inspiring Women conference last week its transformation was ‘absolutely not done’. Shares duly hit a bout of, er, turbulence and plunged more than 19% soon after the markets opened. There was no public indication last week, then, that Green, who had no experience in the travel industry before she called up the chairman of Thomas Cook to put herself forward for the role, was preparing to step down, and Thomas Cook didn't return calls for comment. Despite being a keen proponent of Buddhism and its tenets of inevitability and karma, she also admitted that she wasn’t yet very good at ‘accepting what comes to you’. Green’s departure comes as the company reported full-year sales had fallen 8% to £8.6bn. It also made another pre-tax loss, albeit one of £115m compared to £213m last year. While it said underlying earnings before interest and tax (EBIT) had risen 23% to £323m, there was also the small matter of £269m of ‘separately disclosed items’ - restructuring costs, impairments and provisions for payouts for flight delays. She is unlikely to be twiddling her thumbs for very long - contacted by MT today, Green confirmed that she has already received approaches from FTSE 100, private equity and Asian-based firms, amongst others. All un-named, natch. Thomas Cook’s share price had risen more than 1,000% since Green took over, taking its market cap to just under £2bn, but it had fallen almost 10% to 137.9p in the last year before today. Investors are clearly even more rattled by Green’s departure than any failures in her turnaround, though. Shares were down more than 19% to 111.7p in early trading, wiping some £400m off the firm's value.